The modern apartments of Kalimera Residence are located in a noble Villa which belonged to the patrician family Serra Capriola (see photo n° 1). This old mansion is at Capo di Sorrento, 1 mile away from Sorrento centre. These apartments are advisable above all for those travellers who love nature and relax with comfort: infact these houses are in a typical quiet orange-grove and 400 mt away from the gorgeous rocky beach “Bagni della Regina Giovanna” (steep descent) where, still there 2000 years later, the ruins of a Roman villa are. At the same time the apartments of Kalimera Residence provide air conditioning, TV Colour, an independent access to its autonomous court-yard where our guests can park their cars for free (see photo n° 2), shops nearby. 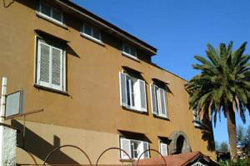 Besides, tourists can reach Sorrento centre easily to appreciate its nightlife. Two-roomed apartment, square meters 35, sleeps 2+1, (rate code: type A), composed of: independent entrance, living-room with sofa- bed for 1 person and cooking-corner, a double-room, bathroom with shower, lumber-room, wide terrace lighted and equipped with a table and chairs. Two-roomed apartment, s.q.m.45, sleeps 2+2, (rate code: type B), composed of: independent entrance, living-room with sofa-double bed and cooking-corner, a double-room, bathroom with shower, veranda lighted and equipped with a table and chairs. 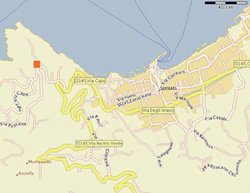 Air Conditioning – TV Color– Free car parking in the property- Free bathing on the rocks – Sandy beach “Puolo” is 700 m away reachable on foot or by car (car parking at the end of the way) - Post Office and Bus stop nearby - bar, food shop, tobacconist’s nearby. The apartments of Kalimera Residence are each one roughly 45 square meters (480 square feet), and they are part of an old Villa which belonged to the patrician family Serra Capriola (see photo n° 1), surrounded by an orchard. They are suitable for 3/4 people (according to the different type). 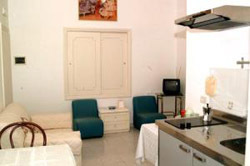 Kalimera apartments are located 1.5 km (a mile) from the centre of Sorrento, along the road which links Sorrento with Massa Lubrense and 400 meters from the seaside. They are near the ancient walkway that leads to the Capo di Sorrento and the famous rocky beach known as “Bagni della Regina Giovanna”. These apartments are advisable above all for those travellers who love nature and peace with comfort: infact these houses are in a typical quiet orange-grove where it is possible to relax. An indipendent access leads to the nice courtyard of the apartments where guests can park their cars for free (see photo n° 2). The apartments are on a raised level of the villa and guests can reach them by going up a short ramp. This takes onto a lovely veranda with a window (only for the apartment type B: see the photo n° 3) that overlooks the courtyard and the garden, which is furnished with table and chairs. From the veranda (or from a nice terrace in the apartment type A) it is possible to enter the living-room, which has a cooking-corner with a two ringed cooker and a fridge. In the living-room (see the photo n° 5) there is a double bed settee. 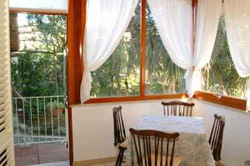 The sitting-room leads to the double bedroom (see the photo n° 4) that has a window with a garden view. The bathroom has a shower. The decor is very refined and comfortable. There is air conditioning. Near Kalimera apartments there are shops, restaurants, post office and car parking. There is an indoor discotheque at a short distance away. All the guests can enjoy sitting in the orchard. There are parking spaces in the garden (see the photo n° 2). The bus stop is 20 meters (20 yards) away from the Kalimera apartments. It is very easy and fast to go to Sorrento by bus because the public service in this area is quite efficient. Every 30 minutes at the most a public bus passes near the apartments. It is sufficient to buy the tickets in the bar in front of the kalimera apartments. WHERE CAN YOU GO TO THE BEACH ? From Kalimera apartments it is possible to reach some beaches on foot (approximately 15 minutes). But You have the choise: the rocky beach of so called “Baths of the Queen Johanna” or the sandy beach of “Puolo”. If You choose the rocky beach with torquoise water of the “Baths of the Queen Johanna” You have to follow an ancient walkway paved in stone (steep slope) and that winds among cultivated terraced olive groves which descend to the sea. This is a walk not to miss: You go down this shaded path and You enter into a forgotten dimension, without traffic or noise. Roman patricians and princes and princesses in medieval times have walked the same way to reach their villas by the seaside. Infact down there, when You reach the beach, You can find the famous ruins of the Roman villa of Pollio Felice where, still nowadays, You find nice mosaic floors and some rooms in good conditions (see the photo n° 6). This place was chosen by the Romans to build their sumptuous holiday houses due to its beauty and mild climate. 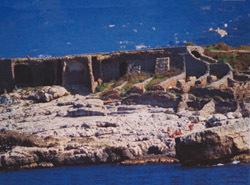 And in particular Pollio Felice house had its own private berth and a small pool of water enclosed by rocks and connected to the sea by a cleft in the rock. Here the matron Romans could have a swim far away from watching eyes. In addition this villa was equipped with fish ponds for breeding fish autonomously for the numerous banquets which took place in that big dwelling. This villa was so beautiful and popular in the ancient times that even the famous latin writer Statius described in his work “Silvae” how beautiful this house was. He stated that each side of the villa faced a different view: one faced Vesuvius, another Sorrento, another Capri, another Ischia etc. Besides in the same work he boasted that he was a good friend of this powerful Roman patrician. Still nowadays it is very interesting to go and visit the ruins of this fabulous villa: free entrance. From the ruins of the Roman villa a pilework footpath runs along the rocks as far as the bay of Puolo. From these rocks it is possible to dive into limpid and crystal clear waters, but it is suitable only to good swimmers for the depth of the sea. 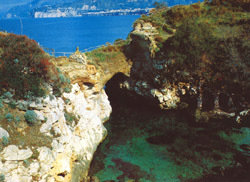 But there is the small beach of Pollio Felice (see the photo n° 7) from where it is very easy to dive and the place is romantically decorated with an ancient arch. You can find this “corner of Paradise” on the right just as You reach the beach. There is a flight of steps which leads to this small beach. Nowadays this beach is called “Bagni della Regina Giovanna” (Baths of the Queen Johanna) because, according to the tradition, that queen came here often to swim, safe from prying eyes. The queen Giovanna II d'Angiò Durazzo ruled the Kingdom of Naples from 1414 to 1435. The tradition says also that she used to meet her large number of lovers in this villa by the beach, built by her will on the ruins of the Pollio Felice house. The villa of the queen spread out also on the promontory behind Capo di Sorrento, with a lot of pavilions for various functions: a banqueting-room, some rooms for the owners and some for the guests, the thermal baths, the rustic section of the villa for producing wine and oil, the kitchens, the rooms for the slaves, etc. But actually almost everything has disappeared over the centuries. If You prefer sandy or pebbly beaches You can go to Puolo beach (see the photo n° 8), which is 15 minutes on foot from Kalimera apartments. You can walk along the main road (in the direction of Massalubrense) and after the first bend (200 meters – 182 yards - away from Kalimera apartments) You can turn to the right and a narrow way leads to Puolo beach where You can find public and paying beaches, restaurants and bars on the seashore. It can also be easily reached by car from Kalimera apartments: paying car parkings available. From Rome reach the main road "A1"direction south (Napoli) and, after leaving Naples, take the main road "A3" to Napoli - Salerno (Not Tangenziale Napoli). Follow always the brown sign “Penisola Sorrentina”. At Castellammare di Stabia, take the road to Sorrento. There is a shuttle that connects the Airport with the main railway station in Rome. From Rome there are several trains to Naples (The trip takes approximately 2 hours). In alternative, (only during working days) from the Tiburtina train station You can take the bus of “Marozzi” company that leaves from the capital at 7:00 am and 3:00 pm: the bus takes directly to Sorrento ( Euros 15.99). From Naples Capodichino Airport You should follow the motorway A/3 Naples-Salerno as far as the exit Castellammare di Stabia; once You are in Castellammare di Stabia You follow the National Road 145 (SS 145) as far as Sorrento which is about 48 kms away from Naples. From Naples airport You can take a taxi or bus to the railway station at Piazza Garibaldi. At the main train station Piazza Garibaldi in Naples You will be able to board the local Circumvesuviana trains which leave for Sorrento every 20 minutes all day long. In alternative, from the Naples Capodichino Airport You can take the bus of “Curreri” company that takes directly to Sorrento with departure at 9:00 am – 11:30 am – 01:00 pm – 02:30 pm – 04:30 pm – 07:00 pm. (The trip takes approximately 1 hour).